Blue Microphones Yeti Review | EXTRAORDINARY! That said, I realize there are people who just want to get a general idea of what you’re getting with this mic. So without further ado, check out what the Yeti has to offer! I own the Yeti, and have been reading about it and following it for awhile. As the reviews pile up, it has retained a high score which is pretty amazing considering: 1) It’s an entry level mic that is pretty cheap. 2) People are very picky about mics in general; their reviews tend to be extremely honest about even the most minute detail. 3) USB mics overall are less reliable and the quality kind of suffers a little in comparison to an XLR condenser mic. What is XLR? This is not the case with the amazing Yeti. Why? It’s built like a freaking tank. When I pulled it out of it’s package, I mistook it for a 5 lb. dumbbell. Lol. Or a mini spaceship. It’s huge, and definitely built to last like Duralast. It’s easy to set up. Literally take it out of the box, plug the USB jack into your computer and Whammo! You’re ready to go. No need for audio interfaces or XLR cables. What does an audio interface do? You’re getting phenomenal sound quality. This is perhaps the biggest draw. For an entry level USB mic, the sound is really impressive. You will be able to instantly tell the difference between the Yeti’s quality and something like the Samson Meteor or Go Mic. Both of those produce fine quality, but you know where that extra money went when you record with the Yeti. I would even go out on a limb and compare it side by side with the AT2020 XLR condenser. To me, the 2020 is a tad more articulate with less background noise, and the Yeti is warmer and smoother with a bit more background noise. It’s extremely flexible. It’s got a mute button, volume control, gain knob, headphone jack for live no latency monitoring (What is latency? ), and 4 different polar patterns for added flexibility (Cardioid, Omni-Directional, Figure 8, Stereo mode). All of the knobs feel really solid as well, and don’t seem like they would break very easily. It’s versatile. You can record pretty much anything with the Yeti and do it well. The stereo mode is perfect for acoustic guitar/vocal recordings, and it’s exceptional for anything podcast/voice over oriented. A+ price to performance ratio. This thing performs like a microphone way out of it’s price range in my opinion. Now let’s get right into specifics! Microphone Type: Condenser. The difference between a USB microphone and an XLR microphone. Polar Patterns: Cardioid, Omni-directional, Stereo, and Figure 8. Sample Rate: 48 kHz. Bit depth vs. sample rate. The Yeti is truly something to behold. For the longest time I thought it was pretty standard in size judging from online pictures, but boy was I ever wrong. 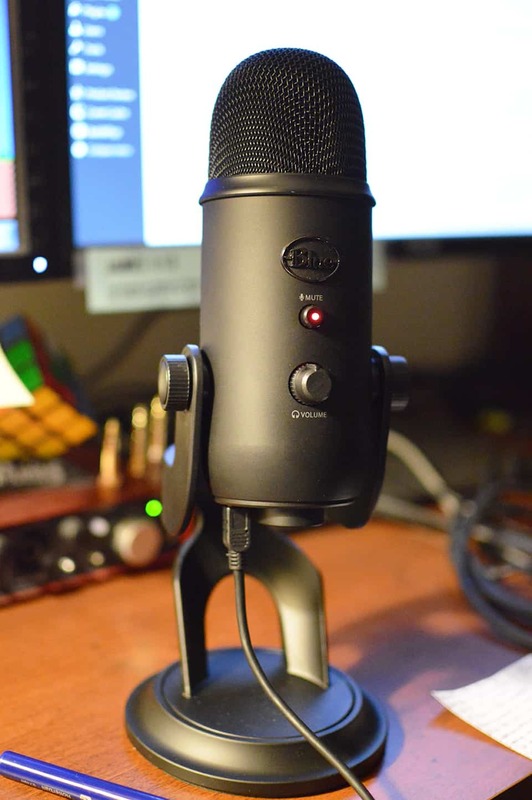 I would always read reviews like “Yeah it stands about a foot tall on your desk.” I suppose I never really thought about just how massive that is for a microphone. Believe you me, this thing has some serious girth, and it’s rock solid. The sound coming out of it is equally as impressive, but I would highly advise a pop-filter or windscreen. The stereo mode polar pattern really impressed me, and works great if you want to record yourself singing and playing acoustic guitar at the same time. It sort of pans your voice to the left and the guitar to the right, creating a nice sense of space and depth. Cardioid, Omni-Directional, Figure 8, and Stereo polar patterns. Mute button on the front. Volume control on the front. Headphone jack for live no latency monitoring in real time. It can also be mounted on a separate mic stand if you so please. Extremely flexible. The on-board features in addition to being able to record just about anything well is a huge advantage over other USB mics. Phenomenal Sound quality. It stacks up well against entry level XLR microphones. Can be mounted on a separate mic stand. Built like a Super Mutant. Versatile. You can record just about anything with the Yeti. It doesn’t have an On/Off switch which would propel it into legendary status. You will have to unplug it from your computer when not in use. It’s kind of irritating but by no means a deal breaker. It does tend to pick up more ambient and background noise than an XLR, but some Acoustic Sound Treatment goes a long way. There will be a link to that article in a bit. Definitely a pop-filter or windscreen, and if you want to mount it on a separate stand, you could opt for a scissor arm or desktop stand. I wouldn’t recommend a boom stand because this mic is simply too heavy. The Rode PSA1. Yes this one is expensive but it’s the best. I’d rather buy the good product and not have to replace it, than buy a cheap product and watch it breakdown. The overall ratings also speak for themselves. Pro Line MS112 Desktop Stand. I have this one and it’s extremely solid and heavy, which works great because the Yeti is like a boulder. Lol. I have had the Samson PS01 since 2007. Enough said. Be aware that if you go this route you will have to kind of Jerry rig it to the bottom of the Yeti, or find another place if you decide to let it sit on your desk. You could also opt for the Foam Windscreen. It’s cheaper and easier to use if you just need something for the Yeti. It also works pretty well for other mics too! The USB chord is extremely long. I didn’t find this to be a bad thing per se, but just be aware of it’s length and find a way to tuck it in (as if you were kissing it goodnight). Lol. As I said in the Cons, it does pick up more background noise than I would like, but then again I do not currently have my room treated. I also have a pair of HD600’s which reveal a heck of a lot of detail. This is just a recording of ambient noise. Here I record the first verse of “Day in the life” by the Beatles. Go easy on me 🙂 This is a raw recording using the stereo mode with the gain all the way down. A startling example of Price to performance ratio. Flexible, versatile, durable, and sounds phenomenal. Background noise is a bit more than I would like, and it doesn’t have an On/Off switch. Other than that this is the best USB microphone on the market, and has everything you need to get started in recording. While other mics lack some of the features, the Yeti has them all. The features alone make this mic a vast improvement over other similar USB mics in it’s class. The Yeti was truly a remarkable investment for me because it’s so user friendly and has a proven track record as far as sound, durability, and longevity. I absolutely love it because it delivers to me the results that I’m looking for, and I feel a sense of safety with it around. Even the raw recordings sound amazing. Well that’s about it for today my friend! 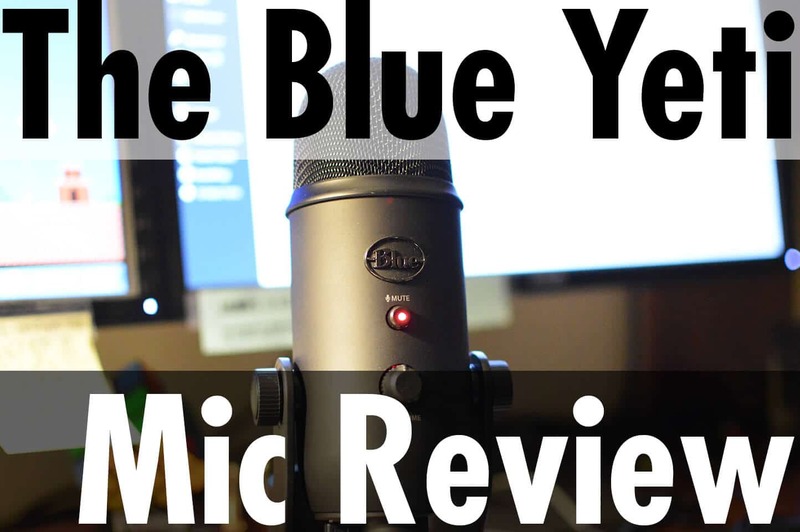 I hope you’ve gotten some valuable information out of my Blue Microphones Yeti Review!! What do you think about the Yeti? Are you likely to take the plunge? A step out in faith? I would love to hear from you. If you have any other questions, or feel I’ve missed the mark on something, please Contact me! First off great site. I’m a recording musician myself and its just a coincidence that you have the Yeti up for review. I just happen to be starting a stream on teaching guitar and this is the Mic I have been looking at. You answered every question I can think of. I had no idea this mic doesn’t have an on/off switch, that is always a good thing to know and not really a big deal. I love how it sounds and thank you for sharing the sound bytes. I have bookmarked you site for future reference, and when it comes time to buy the mic I will definitely be getting it through you. Yeah it’s a great mic. Solid as a rock with loads of features. Let me know how you like it whenever that time comes!! I appreciate your support! Really helpful! Question: I would like to conduct oral history projects using my iPhone for video. Are they compatible? What adapter or additional cables would I need? Also, headset that is really good price/value?